The brilliant Western Media has yet catch on that the Danish Imam who spread this cartoon story thoughout the Mideast is an Islamist extremist and Osama Bin Laden supporter. Imam Abu Laban also faked cartoons to build anger in the Mideast. The Norwegians will not be entertaining anytime soon. A Syrian policeman stands in front of the damaged Norwegian Embassy that was attacked Saturday Feb. 4, 2006 by angry demonstrators protesting offensive caricatures of Islam’s Prophet Muhammad. 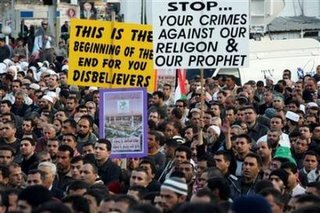 Thousands of Syrians enraged by caricatures of Islam’s revered prophet torched the Danish and Norwegian embassies on Saturday _ the most violent in days of furious protests by Muslims in Asia, Europe and the Middle East. (AP Photo STR). 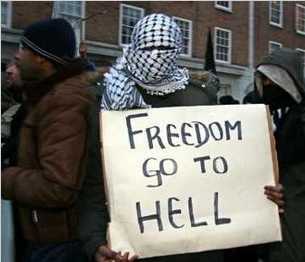 In London one protester has his thoughts bass ackwards. Relapsed Catholic has verse from “1784” where a playwrite was running into similar problems as the Danish newspaper. – Via Small Dead Animals. Muslims have threatened to target Christian Churches in Europe over the cartoon row. 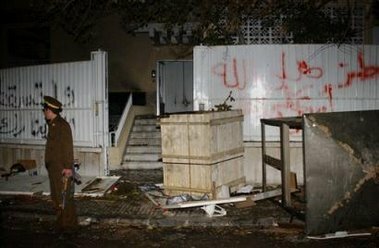 Iraqi Churches fear that the deadly bombings of their churches last month were linked to Muslim fury over cartoons of the Prophet Mohammad published in Europe. Glenn Reynolds sees a case of the barbarians verses civilization. Rantings of a Sandmonkey has more pictures.